April 9, 2014 April 9, 2014 filipinocavedivers Cool Stuff! The Del Carmen Cenote #1 is among the epic finds of FCD underwater cave explorations. It is located in Barangay Quezon of Del Carmen, Siargao Island right on the border with Barangay Tuboran, the heart of Del Carmen’s maze of underwater caves. Figure 1 below shows the roughly rectangular cenote. Fig 1. The Del Carmen Cenote #1 depicting its Northeast and Southwest end. Cenote (pronounced sen-o-teh) is an American Indian word which means “the underworld dwellers’s window to the outside world”. The word is now commonly used in the cave diving world, referring initially to the sinkholes of the underwater caves of the Yucatan Peninsula in Northern Mexico where cave diving is popular. 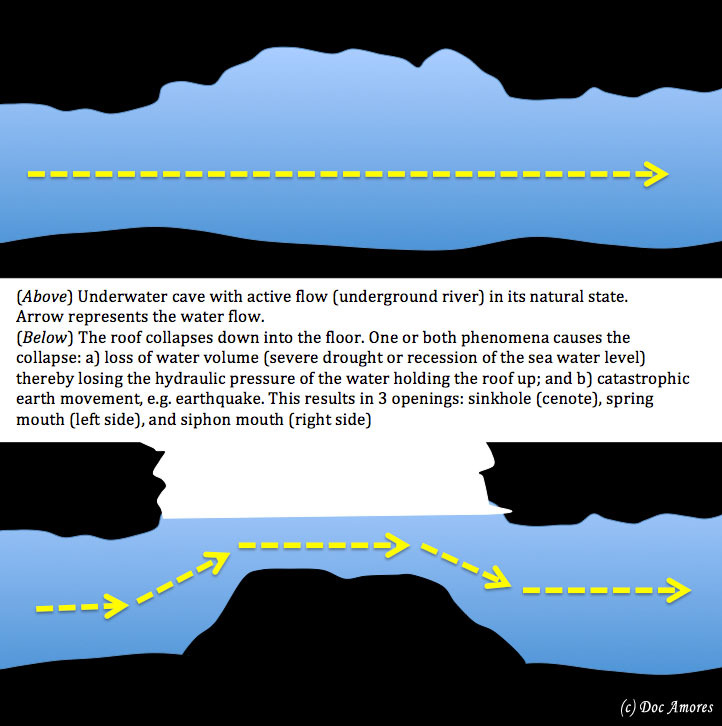 Physically, it is a collapse of the roof of a body of water underground. Figure 1 below represents a classic formation of a sinkhole in an underwater cave with a flow. The Del Carmen Cenote #1 located in the municipality of Del Carmen, Siargao Island represents a classic underwater river sinkhole. Our FCD team dived the area on April 3, 2014. 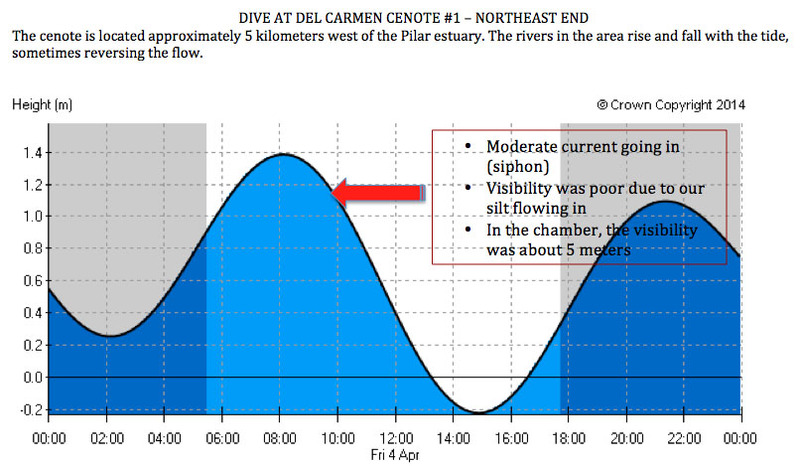 Figures 3-5 below show the dives in the roughly rectangular sinkhole as depicted in the tide chart of Pilar, Siargao Island. Fig 5. Four (4) hours after the dive in Fig 3, the same south end now becomes a siphon as the seawater recession (ebb tide) subsided pushing the flow back into the southwest opening. As noted in Figures 4-5 above, the openings reverse roles – siphon to spring to siphon – depending upon the tide. This makes Del Carmen Cenote #1 one unique cave diving destination. Not many places in the world are like this. The cenote is a 24/7 dive site, with many different options for diving depending on the purpose of the dive, using either opening. At proper tide timing this can either be a no-current dive or a spring dive with significant flow for pull-and-glide dive propulsion exercises. 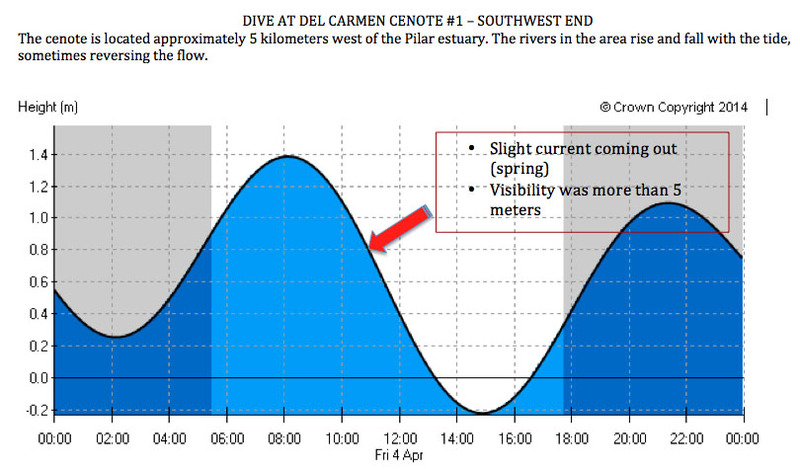 Del Carmen Cenote #1 will end up a favorite dive site in Asia…if not, the world. FCD Siargao Expedition Members: Doc Amores, Lyndon Cubilan, Jaime Ballori Lapac, Ferdinand Edralin, Jake Miranda, Larry Williams (Associate member). Del Carmen Mayor Alfredo M. Coro II, Tuboran Barangay Captain Marlon M. Coro, Cel Carmen Vice Mayor Andie Tan, the Cubilan Clan of Del Carmen, Tuboran Kagawad “Kap” Randy, caver-extraordinaire Bartolome “Toloi” Daclan, and the hospitable community of Del Carmen.